In the previous post, you learned to create a simple program to extract an existing zip file. Sometimes, you might want to implement file zipping in your programs. So it is worth to learn how to write Java code to create a zip file or many zip files. In contrasting to zip file extraction, you need to use the ZipOutputStream class to write the contents of the source files or directories to the output file. The ZipEntry class is used to create a zip entry object. This object can be file or directory. The putEntry method of the ZipOutputStream class is used to add the zip entry to the output zip file. Its write method is used to write the content of a source file object to the output zip file. The below example program allows the user to add many files or directories to the JList component. 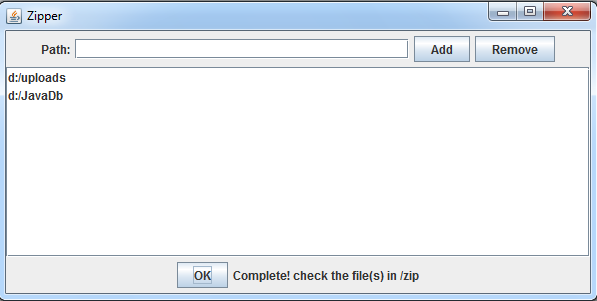 When the OK button is clicked, all paths of the source files or directories are processed to create zip files. The output zip files are placed in your current working project folder. The zipFile method is the main path of the program. The sources to be zipped can be file or directory so that they are processed separately. We create additioal two methods, compressFile and compressDir. If the source is a file object, the compressFile method is invoked to compress the file. Otherwise, the compressDir is invoked to compress the contents of the directory. The contents of the directory can be files or directories so the compressFile and compressDir methods are invoked recursively until all files and directories are written to the output zip file.